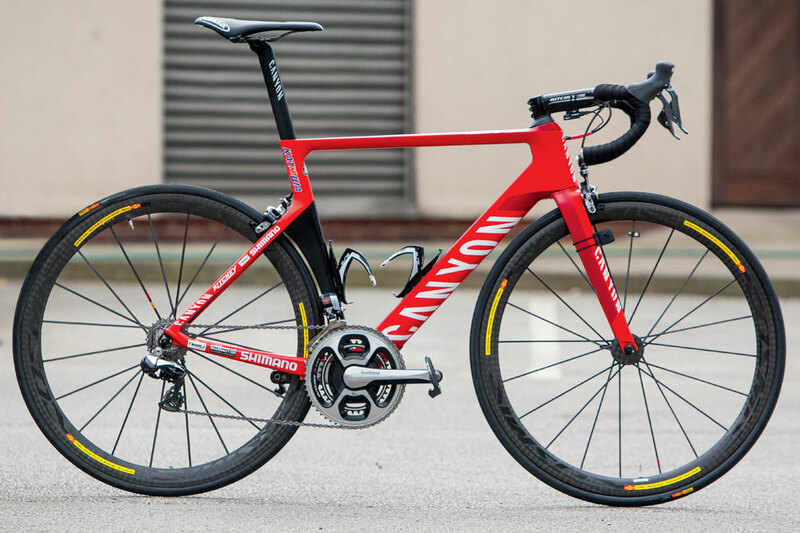 We caught up with team Katusha at a pre-season training camp in Spain to see just what the Norwegian sprinter Alexander Kristoff’s new bike looked like. Kristoff is still using the same Canyon Aeroad CF SLX frame he used last year, but most of the components have changed. Katusha have switched sponsorship from Shimano to SRAM for the 2016 season and its team bikes are now fully kitted out with the wireless SRAM eTap groupset. Having switched from SRM and Mavicm, they are also using SRAM’s Quark crank based power meters and Zipp wheels. Here, Kristoff’s bike is fitted with Zipp 404 Firecrest clinchers with Continental Grand Prix 25mm tyres. Presumably the wheels he favours for training, with tubular wheels still being the preserve for racing. Gearing is a 53-39t chainset and 11-28 cassette, which interestingly appears to be a SRAM Force cassette and not Red. Kristoff has opted for Canyon’s neat integrated bar and stem, to further maximize the aerodynamics of his steed. Interestingly, the team doesn’t appear to have got hold of Canyon’s new out front mount, meaning that Kristoff is using a standard Garmin mount, stretched over the stem. >>> How much faster is an aerobike? One of the coolest features is the custom Selle Italia SLR flow saddle which features a nod to the Nordic hardman’s routes, with an axe toting Viking. Kristoff loves the Aeroad so much, that he even chose to ride it on the cobbles of Paris-Roubaix, when other riders chose more compliant bikes. We think its pretty cool too and with its simple red and white livery, definitely one of the best looking bikes in the pro peloton. So you can compare, pictured below is Kristoff’s old bike with Shimano Dura Ace Di2, Mavic Wheels and and SRM. Kristoff’s new SRAM equipped bike doesn’t have the sprint shifters seen here on his old Shimano eqipped machine.